CTL: More pain, more gain? 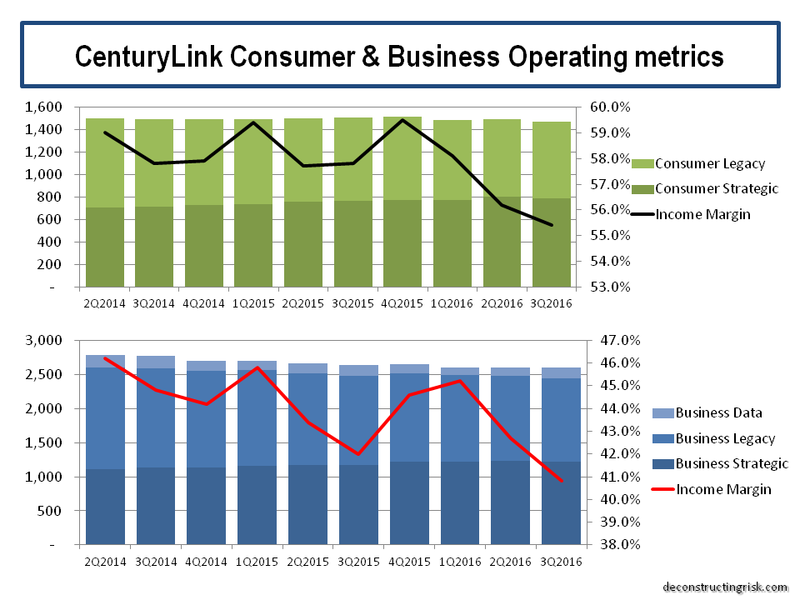 So, a lot has happened with Centurylink (CTL) since my last post in November. CTL is down 30% since then (and over 40% since its August high) and the big news is the dividend cut of over 50% fueling further fears about growth. As a long-term investor in the telecom sector, such moves, although disappointing, don’t surprise me. It was always going to be a big ask to clean up some of the old CTL businesses in short order. As I stressed in previous posts on CTL (most recently here), investing in a business wireline telecom with legacy headwinds is high risk, some call them melting ice-cubes, and the dividend yield reflected that. I am accustomed to the bumpy ride it entails after 20 odd years of playing in this sandpit (see this old post)! Spending some of that juicy dividend to buy insurance through options may seem like a waste of money at the time, as all insurance does, but in this case, it has helped mitigate the downside pain. I have been buying puts here and there over the past year or so, particularly where I saw value (generally on the upswings). For example, last August when CTL was trading comfortably above $20, the January 2020 puts at a $15 strike were available around 80 cents whereas these options are now valued over $3. Before I go into detail on my thoughts on CTL following the latest results, I wanted to zoom out and look at the broader picture. 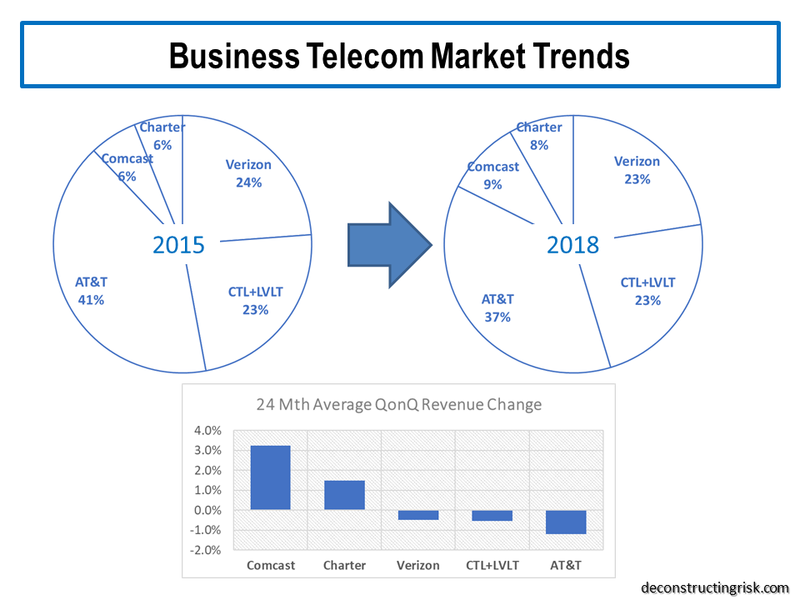 The business or enterprise wireline telecommunications market has flatlined, at best, and is in a transitional fight for its survival. Legacy services are rapidly been eroded by new technologies and the growth in newer services is struggling to make up for the top-line loss of legacy services (as per this post). Potential new sources of growth include deep fiber reach and transport needed for the much hyped 5G (see this post on 5G), increased traffic from new OTT video offerings from players such as Disney (see this post on telecom’s troubles), and the rapid increase in “as a service (aaS)” enterprise products enabled by the cloud era. I found a section from Verizon’s 10k captured the dynamic nature of the competitive enterprise marketplace, as below. So, what may the telecom provider of the future look like? In this report from last year PwC speculated on the profile of two successful telecoms of the future – BaseLink and DigiLife. BaseLink, after several unsuccessful attempts to diversify, found success in a strategy of focusing on the network as a service (NaaS) by automating its processes, reducing the workforce, densifying its fiber network through M&A, purchased 5G spectrum and modernising its network by embracing software-defined networking and network function virtualization. In addition, it focused on product offerings for specific industry verticals such as media, gaming, health, financial services, and autonomous driving. DigiLife, on the other hand, saw the need for a neutral global cloud-based data platform that offered consumers a trusted means of protecting their digital lifestyle foot-print from the giant technology firms whilst offering consumers the option to trade their data, either voluntarily or for compensation, through a data exchange. Obviously, both cases are purely hypothetical, but they do illustrate the tension in adapting business models from an engineering approach of providing capital intensive network products to a more service client driven approach that provides cost effective and flexible solutions. I do find it interesting that Verizon has taken on the NaaS term in its latest investor meeting when talking about services to be provided over its intelligent edge network (iEN). 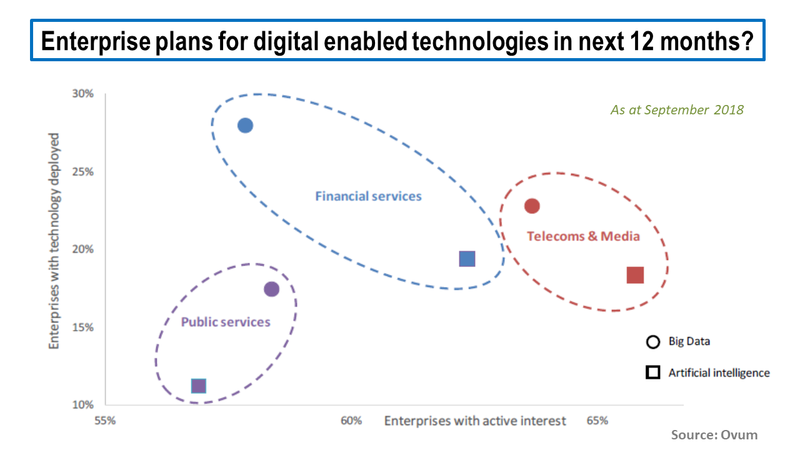 In this recent Analysys Mason report, commissioned to endorse a specific provider, they state there is “a time-limited opportunity to become the single point of contact for their enterprise customers’ information and communication needs if they put in place digital platforms that enable enterprises to buy business applications, IT infrastructure services, and cloud-based connectivity with a unified digital experience”. 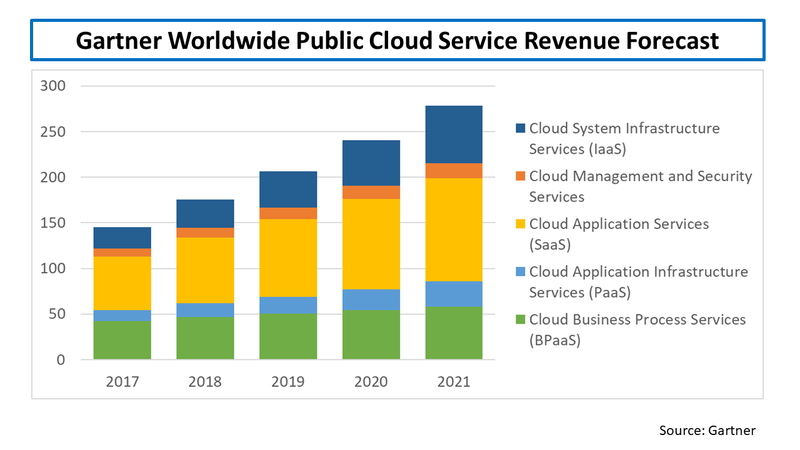 Analysys Mason calls this platform a “Enterprise Platform as a Service (EPaaS)” and estimates its value at $300+ billion on top of their enterprise connectivity market, as detailed below. 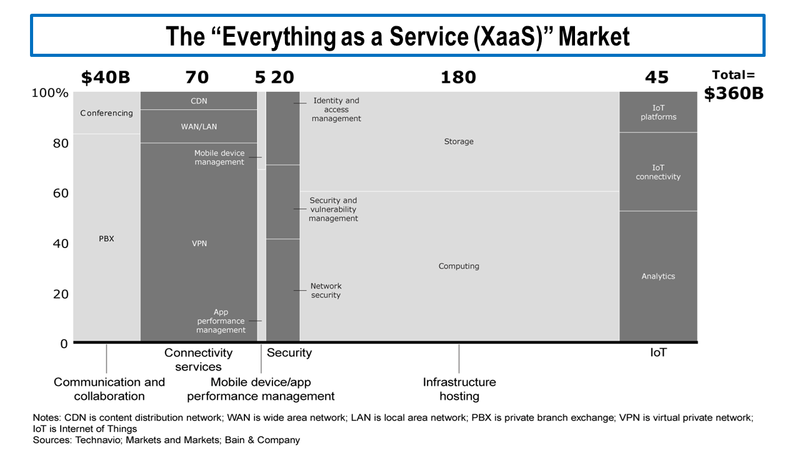 Bain has a more upbeat vision of the future for some telecoms (here) based upon an “everything-as-a-service” (XaaS) model with a $400 billion-plus addressable market by 2025, as per the exhibit below. Bain acknowledges that “much of this business is already out of reach due to the scale and prior moves of massive hyperscale companies like Google, Facebook and Amazon, which aim not only to lead the public cloud and cloud services industries, but to expand into numerous related businesses as well”. 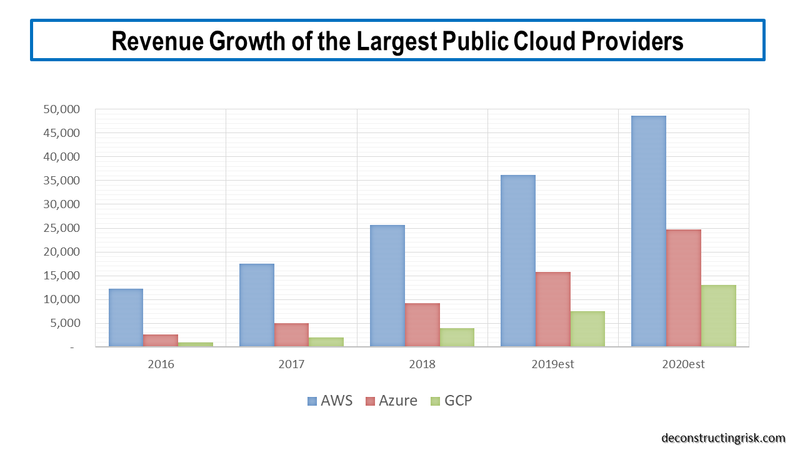 The growth of the large public cloud providers has been much publicised and can be seen in the projections of the largest 3 providers below. Hybrid cloud, where firms use a combination of their own on-premise infrastructure and one or more of the public firms, is the hot topic of the moment and highlights the need for enterprise specific connectivity and bandwidth to tie a firm’s assets to their public cloud provider(s). Although some firms will likely migrate all or most of their IT needs to the cloud, many will continue to run some applications on-premises for security and compliance reasons, whilst utilising the public cloud providers for other applications where scale and flexibility are needed (not to mention cost considerations). 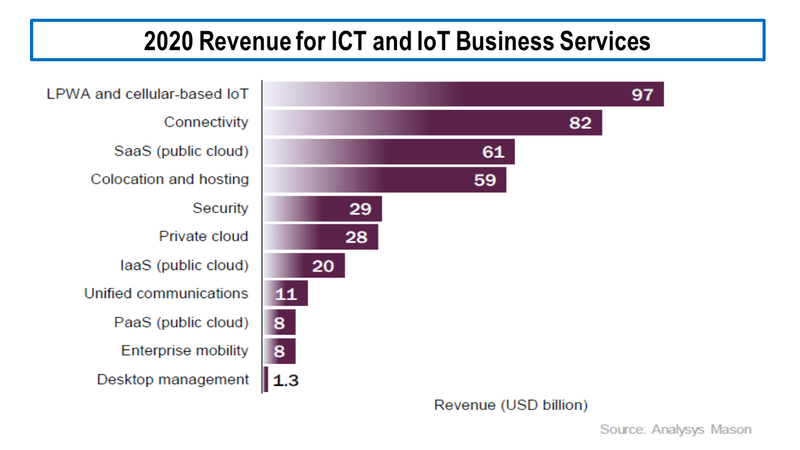 IDT claimed that 50% of IT spending in 2018 was cloud based. Firms such as IBM are betting big on the growth in hybrid cloud with their recent acquisition of Red Hat. With a plethora of “aaS” acronyms, in September Gartner projected that 90% of firms will purchase public cloud services from an integrated infrastructure as a service (IaaS) and/or a platform as a service (PaaS) provider, stating that “strategic initiatives such as digital transformation projects resulting in the adoption of multi-cloud and hybrid cloud fuel the growth of the IaaS market”. A copy of the Gartner projections is below. The recent announcement by Google of a $13 billion capital expenditure in 2019 on US data centres is a testament to how aggressive the big internet players are. The projections below from Ovum (from this presentation) estimate that the big players will be responsible for approx. 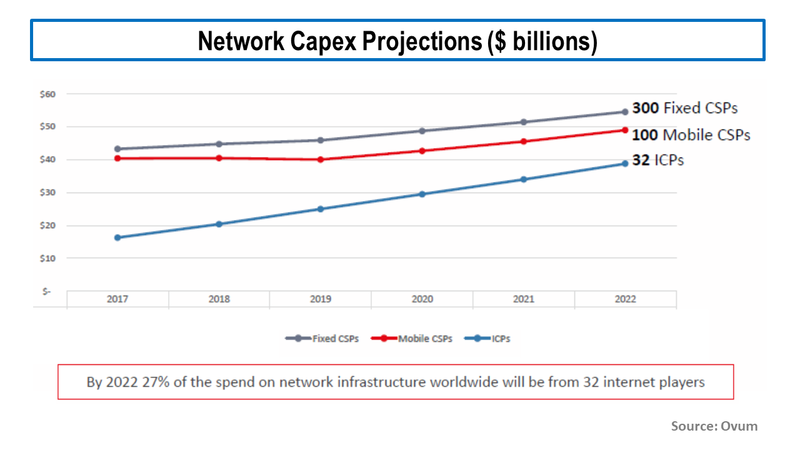 30% of all network capex by 2020. Notwithstanding the growth in the large cloud providers, Bain states that by 2025 “more than half of telecom B2B revenue growth will have been derived from XaaS models if these companies adopt strategies that differentiate them from hyperscale cloud players”. Clearly, a major challenge for traditional telecoms will require them to change their business models and cultures to adapt to the needs of providing capacity on a flexible “aaS” basis. Bain emphasizes the need for telecoms to tackle legacy IT systems and organizational complexity saying, “companies that successfully transform their commercial engine reboot their IT systems, embrace the importance of data and artificial intelligence (AI), and significantly overhaul their operating models”. McKinsey, in this article, also states that “such a transformation encompasses both the digitizing of core customer journeys and internal processes, as well as using data to drive real insights”. Some in the telecom industry are clearly taking the need to adapt and transform seriously, as a survey from last September by Ovum illustrates, as below. The top 3 areas of focus for telecoms were network fault predictions, customer operations, and self-optimizing networks. The challenge of adapting to the new market realities is a massive one, particularly when pitted against such agile and strong competitors. 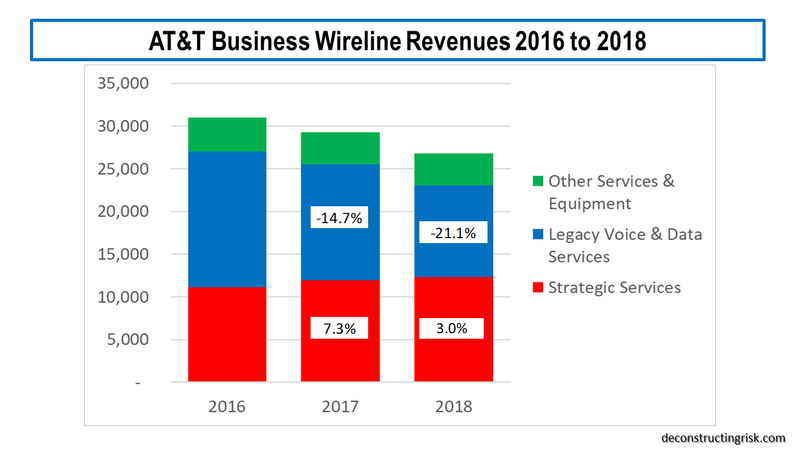 The case of AT&T, the largest wireline business telecom, illustrates the challenges, as its revenues over the past 3 years show. After adjusting for the impact of the new revenue recognition accounting standard ASC606, I estimate at a sequential quarterly growth in strategic revenues of 1.1% and sequential quarterly decline in legacy revenues of 3.7%, it will take another 7 years before the overall annual business levels reaches 2018 levels again! Clearly better growth is needed in strategic services. AT&T contend that they “are rapidly converting to a software-based network and managing the migration of wireline customers to services using IP” and this transition will continue “through at least 2020”. AT&T further contend that “software-based technologies align with our global leadership in software defined network (SDN) and network function virtualization (NFV)” and commit “to virtualize 75% of our network by 2020”. Verizon is also implementing rapid changes, reducing its workforce, and through their “One Fiber” initiative (building 25,000 miles of fiber outside their ILEC footprint) is “building a single highly resilient and scalable fiber network that will allow us to efficiently provide advanced data services to customers across our consumer, business and enterprise customer groups”. Verizon are calling their optimised fiber network that will operate across all their segments, including wireless, the Intelligent Edge Network. Both firms warn that legacy wireline services will continue to decline through 2019 and beyond. Before I go into more detail on CTL, it’s worth reiterating the point that Jeff Storey opened the Q4 call on concerning the unique and extensive set of fiber assets that CTL has assembled. These assets are highly relevant for the future networked economy. Shareholder Southeastern highlights the high value that “entities such as infrastructure funds and cable companies have paid in recent private transactions for fiber assets”. The price that the public fiber assets of entities like Zayo and Lightpath (and possibly parts of Windstream now they are in Chapter 11) will likely highlight this further. 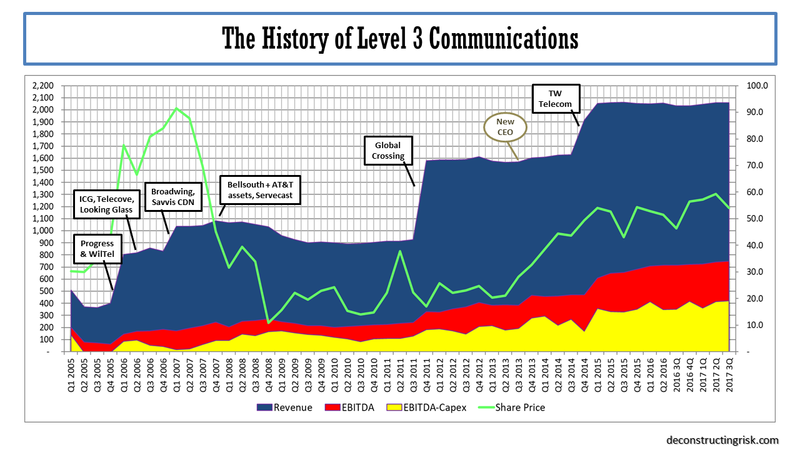 The operating history of Level 3 (LVLT) before the merger with CTL, as illustrated below, shows how a stable or growing top-line is a pre-condition to the market granting a suitable valuation. LVLT’s history also shows how it takes time to get to such a stable or growing top-line following a merger and overcoming the tailwinds of the old CTL’s legacy business may take longer than previous LVLT purchases! Despite the argument from CTL management that the reason behind the dividend cut was purely to deleverage quicker, thereby reducing credit risk and increasing their financial flexibility, the market suspicion is that the action reflects a weakening in top-line projections. I did think that the modest pace of previous projected deleveraging, getting below a 3 times debt to EBITDA level by 2023 in my previous base scenario (as per this post), could have created issues in a raising interest rate environment and/or an economic downturn. Since last year, reduced leverage targets at competitors AT&T and Verizon of 2.5 and less than 2 by year end 2019 illustrates heighten market concerns over debts levels (except for Charter which happily remains a market darling with leverage above 4). Notwithstanding this environment, CTL’s decision to cut the dividend so soon after rigorously defending the previous level does raise a red flag. As per my previous post, I am just going to focus on a base and pessimistic case for CTL in this post. It is too early in the technology convergence story to explicitly factor in any upside from the issues discussed above. Take 5G, for example. The hype has gone into overdrive recently with both AT&T and Verizon claiming they will have extensive coverage everywhere and will be able to gain market share in product areas like wireless broadband. Admittingly, they both have over a million route miles of fiber (albeit that material amounts are in their ILEC regions), but they cannot be everywhere. 5G coverage for critical functions like autonomous driving or business critical IoT monitoring will need ubiquitous coverage, including backup options. Its not the same as mobile users putting up with bad reception in black spots. In Europe, the major carriers are already talking about sharing infrastructure. CTL has 450,000 route fiber miles with a global reach, 350 metro market networks, and 150,000 buildings on net. Given the need for dense fiber to support 5G networks, CTL should be able to pick up some business (even if it does loose some broadband customers!). The CEO of Orange Business Services Helmut Reisinger claims that by 2025 60% of data will be generated by enterprises. Below are a couple of metrics relating to the largest public US based business wireline (e.g. enterprise + wholesale) players for context. As a result of the dividend cut, I have reduced the top-line assumptions in my previous base and pessimistic scenarios, as illustrated below. My estimates are based upon a mix of 3 separate projections – using the trends by business unit, by product, and by assumed consumer and enterprise legacy versus strategic trends. One positive to come from the Q4 call was better insight into their 3-year operating plan and, of course, clarity on the quantum of further synergies and transformation costs. My new base scenario assumes revenue declines bottom out in 2020 at $22.6 billion representing an approximate 9% fall from the 2016 total, growing modestly thereafter at an average annual growth rate of 94 basis points for the following 8 years. My new pessimistic scenario assumes revenue declines bottom out in 2023 at just over $21 billion representing an approximate 15% fall from the 2016 total, and flat-lines thereafter. A breakdown of what each scenario looks like split between legacy and strategic revenues for the consumer and business segments is presented below. 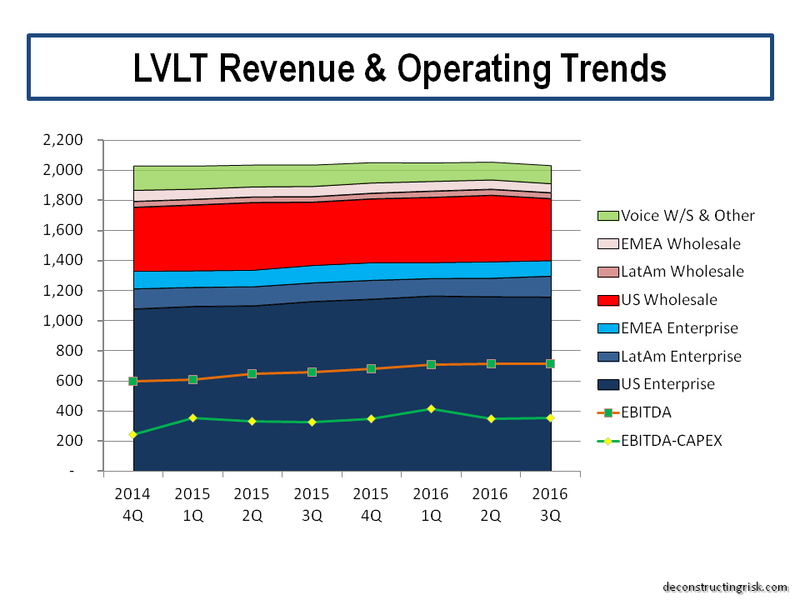 These figures are my guestimates based upon the pre-2017 CTL category splits and my estimates of LVLT’s legacy and strategic revenues. The 2018 and forward splits are my estimates, so caution is warranted in reading too much into them. The key driver of CTL’s future is the growth in the strategic enterprise line. For 2018, I estimate that it makes up 55% of total revenues (with legacy enterprise making up 20%). Strategic consumer business (including the regulatory business) makes up 16% with legacy consumer 10%. So, CTL must contend with the headwind of approximately 30% of its business being legacy (which by the way will never go to zero). The history of the telecom over the past 30 years shows that new technologies are constantly cannibalising the business, so today’s strategic will be tomorrow’s legacy! By way of comparison with AT&T on the business revenues only, I estimate that CTL’s strategy:legacy split is 73:27 with AT&T’s 46:40:14 strategy:legacy:other split (although care always must be taken over different firms’ definitions of strategic and legacy). Now for the good news (and the only reason I still bother with this melting icecube)! The split between legacy and strategic is important as generally the legacy business is higher margin, particularly in the consumer segment (see this post for more on its importance). My model calculates the underlying EBITDA erosion as the legacy revenues burn off and then applies the synergies achieved to date and the newly announced transformation synergies over the next 3 years. I have assumed that the full $1 billion of synergies will be achieved over the next 3 years based on management’s record of execution in the past and based off the original $250-350 million of projected gross margin improvement from network groaming (which history shows they are expert at delivering on) as existing business is moved on-net that are included within the transformation cost projections. I have also assumed that the top range of the one-off costs of $650 million will be required. I am assuming the synergies will be realised roughly evenly over the next 3 years with the bulk of the one-off costs occurring in the first 2 years. Another important consideration is the $100 million hit to EBITDA due to the change in the leasing accounting standard in 2019. CTL are the only company I can find that have explicitly quantified the impact of this change in their 2019 guidance. My model takes all these items into consideration and calculates that, in the base revenue scenario above, CTL can achieve a 42% adjusted EBITDA margin by 2021 and I am assuming this margin is maintained thereafter. In the pessimistic revenue scenario above, CTL can achieve a 41.5% adjusted EBITDA margin by 2021 and I am assuming this margin is also maintained thereafter. By 2021, CTL have now guided for, including those synergies already achieved and those projected over the next 3 years, between 7.25% and 7.5% of margin improvement compared to the underlying EBITDA margin adjusted for the business mix changes and revenue declines. In my analysis, I am assuming capital expenditure at 16% of revenues throughout. The changes under way in the sector, as outlined throughout this post, highlight the need for CTL to continue to invest in their network to remain competitive. CTL management have always stressed the importance of their network and operational cost advantage in competing in this sector (which their enterprise margins attest to) and given the cost transformation and investment programmes under way across nearly all their competitors, it is vital that they continue to invest to profitably grow their strategic businesses. For the base scenario, I estimate they can meet the mid-range of the 3.25 to 2.75 leverage target by the end of 2021 whilst maintaining the $1 dividend, as illustrated below. I have not assumed there will be any further cash-flow special items such as tax rebates or a pension contributions above the usual annual $100 million. Such items, if positive, could get CTL to the lower range of their leverage target by end 2021. Assuming the 2018 results are normalised for the tax rebates, the additional pension contribution, the lease accounting change and 16% capex, my calculations in the base scenario point to ongoing improvements in the level of EBITDA and free cash-flow for each of the next 3 years, averaging above 2% and 8% respectively. For the pessimistic scenario, I estimate they can get below the top of the 3.25 to 2.75 leverage target by the end 2021 if the $1 dividend is eliminated in 2020, with more aggressive deleveraging than the base scenario thereafter, as illustrated below. Again, I have not assumed there will be any further cash-flow special items. Assuming the 2018 results are normalised as above, my calculations in the pessimistic scenario point to a flat to small decline from the $9 billion level of EBITDA and free cash-flow growth averaging 5% for each of the next 3 years. Based upon the improved credit profile of CTL in both scenarios and maintaining a WACC of 8% in my calculations (the termination growth rate is scenario dependent), it will be no surprise that my DCF valuation has improved for CTL to $30 and $18 for the base and pessimistic scenarios respectively (compared to $23 and $14 in my previous post). These figures suggest CTL is seriously undervalued over the medium to long term. Most analysts have reduced their target price on CTL in recent weeks, often citing a lack of any upside catalysts, to around $14. The stock is currently trading around $13. 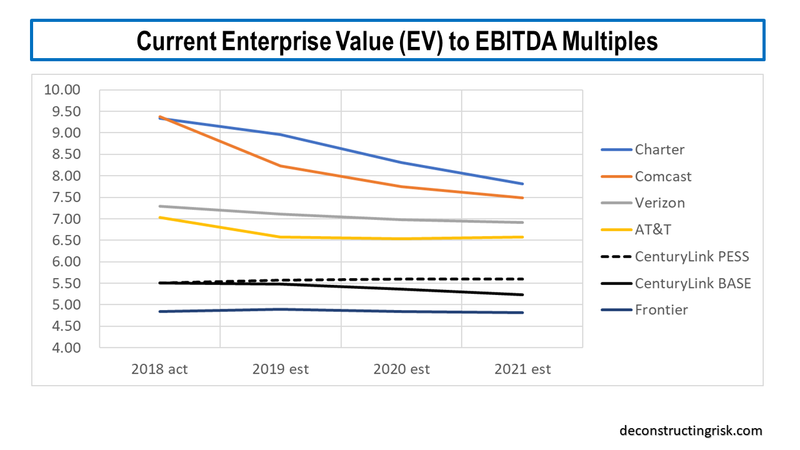 A comparison of valuations with their main competitors, using average analyst estimates, is below, on the current enterprise value (EV) to 2018-2021 EBITDA multiples. I have not included Windstream (WIN) due to uncertainty over their future as a result of their current Chapter 11 status after their sale and leaseback arrangements fell apart. Also, the Frontier (FTR) figure is relatively meaningless given that their debt makes up 98% of their EV (due to their fall in EBITDA in 2018 and their 4.75 debt to EBITDA leverage). 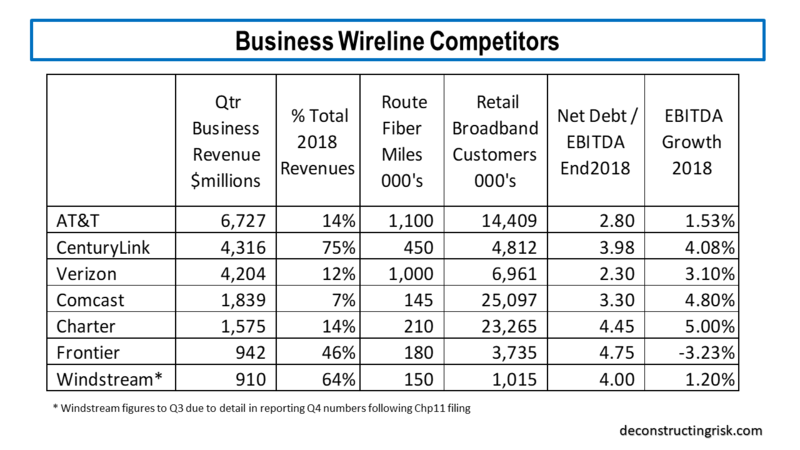 Although some commentators lump CTL in with WIN and FTR, the exhibit above showing metrics on wireline competitors shows the comparisons are superficial. If CTL were valued between a 6 and 6.5 multiple, which feels fair given their improving credit risk profile, the current share price should be around $20. So, in summary, I remain bullish on CTL in the medium to long term but, like the analysts, I am concerned about catalysts for the stock in the short term. If my base scenario is correct, then 2019 will see revenue erosion similar to 2018 before stabilizing in 2020. I can see the share price go lower through 2019 if the current negative sentiment and top-line focus continues. I have therefore reduced my exposure and cashed in on some of the protections. I could be wrong, and CTL could again beat its guidance in 2019 and show the market that the dividend cut wasn’t about operating trends. I would be delighted to be proven wrong. My take on the dividend cut is slightly different than the market. CEO Jeff Storey would have known that his credibility would take a hit over the dividend cut but I think he is considering the endgame. At 59 and with a history of heart problems, I think Storey is focussed on his legacy. In 3 years, a transformed and deleveraged CTL will be in a much stronger place than today. It is possible that CTL could be a target before 2021, by say T-Mobile or Sprint if their deal falls apart. But none of their competitors (aside from Verizon which would have anti-trust issues) are strong enough currently. 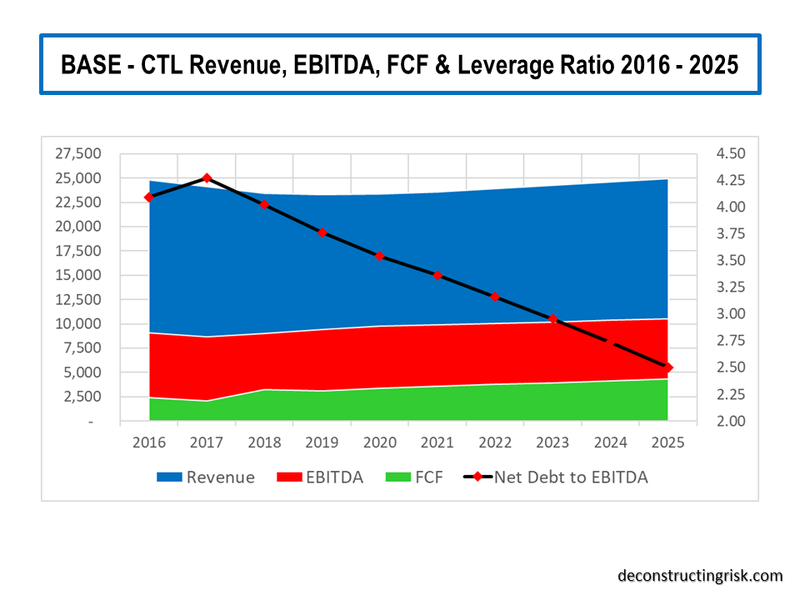 CTL has too much debt for a go private deal from the leveraged players (unless the buyer sees the upside of buying out the equity and accelerating the transformation and deleveraging initiatives). I can’t see any of the top 3 cloud players being interested (they get cheap capacity from the market as it is) or be allowed to by regulators. It’s possible one of the smaller cloud firms, like IBM, may consider making a sector changing strategic move, buts it’s a long shot. All in all, I very much doubt a buyer will emerge in the short-term although it will be interesting to see if Southeastern can unearth anything. More pain before more gain is an apt summary for the current downtrodden CTL shareholder. Before I unleash my musings on the latest Centurylink (CTL) results, building on this recent CTL post, I will touch on some industry trends and some CTL specific items that are relevant in my opinion. As regular readers will know, the increased use of artificial intelligence (AI) by businesses, particularly in business processes, is an area that fascinates me (as per this post). How such process improvements will change a capital- and labour-intensive sector such as telecom (as per this post) is one of the reasons I see such potential for CTL. Whilst reading some recent articles on digital developments (such as this and this and this), I cannot but be struck by the expanded networking needs of this future. All this vast amount of new data will have to be crunched by machines, likely in data centres, and updated constantly by real time data from the field. Networks in this era (see this post on 5G) will need to be highly efficient, fluid and scalable, and have a deep reach. Very different from the fixed cost dumb pipe telecoms of old! CTL have outlined their ambition to be such a network provider and are undertaking a digital transformation programme of their business to achieve that goal. CEO Jeff Storey has gone as far as saying that CTL “is not a telecom company, but that we are a technology company”. Time will tell on that one! 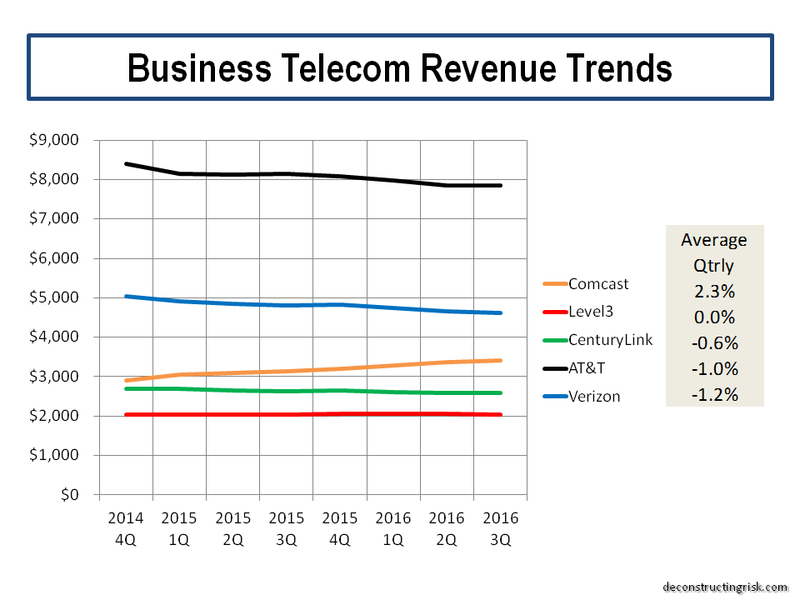 Today, industry trends from business telecom revenues (i.e. enterprises from SME to global giants plus wholesale business) are flat to declining, as highlighted in this post. Deciphering recent trends has not been made any easier by the introduction of the new revenue recognition accounting standard ASC606. Where possible, the updated graph below shows revenues under the new standard from Q1 2018. This data shows an estimated annual decline in overall annual revenues for 2018 of 1.5%, compared to 1.2% in 2017 and 2% for each of the preceding 2 years. Over the past 8 quarters, that’s about a 33-basis point sequential quarterly drop on average. Different firms are showing differing impacts from the accounting change on their business revenue. Comcast showed a 6.5% jump in Q1 2018 before returning to trend whilst AT&T showed a 4% drop in Q1 2018 before returning to more normal quarterly changes. Rather than trying to dismantle the impact of the accounting change, its easier to simply accept the change as its obvious the underlying trends remain, as the bottom graph above illustrates. Whilst accepting these 5 firms do not make up all the US, let alone the global, telecom market, some interesting statistics from this data are shown below. 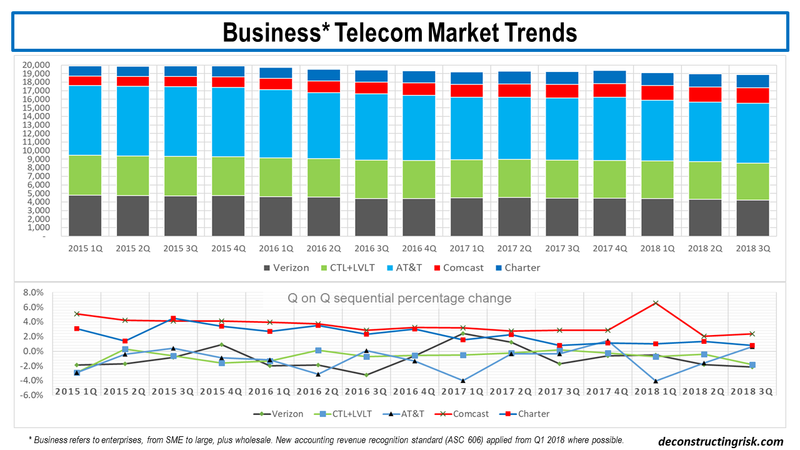 Although the accounting change has likely skewed figures in the short term, the exhibit above shows that AT&T is losing market share whilst the cable firms are growing their business revenues albeit from lower bases than the big players. Verizon and the new CTL have performed slightly below market trends (i.e. 50 basis point average quarterly sequential declines versus overall at 33 basis points). Before I get onto CTL’s Q3 results, this article from Light Reading illustrates some of the changes underway at the firm to transform its business. The changes are centred around 4 themes – increasing network visibility, delivering business-owned automation, encouraging a lean mindset, and skills transformation. On network viability, CTL is layering federation tools on top of its existing systems. Federated architecture (FA) is a pattern in enterprise architecture that allows interoperability and information sharing between semi-autonomous de-centrally organized lines of business, information technology systems and applications. The initial phase of this federation was with customer and sales systems such as those used for quoting, order entry, order status, inventory management and ticketing. The goal is to move towards a common sales ecosystem and standard portals that automate customer’s journeys from order to activation and beyond. A common narrative of CTL’s transformation is to give customers the tools to manage their networking capabilities like they do using the cloud. This is more of a network as a service or network on demand that CTL say is the future for telecom providers. This interview with the newly appointed CTO of CTL gives further insight into what the firm is doing in this on demand area, including changes underway to meet the increased SD-WAN demand and the upcoming deluge of data in the 5G era. Business owned automation is allowing different business units to own their own automation projects, whilst been supported by centralised centres of excellence in areas such as robotic process automation (RPA), digital collaboration, mobility and analytics. Training is provided by the centralised units. Empowering the business units encourages a key cultural change in adopting a lean mindset across the firm. Ensuring that people in the firm are retrained and motivated is a core part of CTL’s plans as change only comes from within and as the firm continues to downsize (they have already reduced headcount by 12%) its important that staff morale and skills transformation is a focus as the business changes. So, moving on to CTL’s Q3 results. The market has not reacted well to the Q on Q drop of 3.6% in revenues, with weakness seen across all business segments, and the stock is trading down around $19 as a result. The trends highlighted above have been exasperated by CTL dropping or renegotiating lower margin business such as contracts involving customer premises equipment (so called CPE). Of the $80 million quarterly revenue drop (under ASC606) in Q3, $30 million was attributed to the culling of low margin business. The remaining $50 million drop is about twice the average drop in recent times, thereby raising analyst concerns about an increase in trend revenue declines. However, there are two points to note here. Firstly, using revenue figures before the application of ASC606, the net drop was more in line at $37 million (i.e. $67-$30) and comparable with the Q2 non-ASC606 drop of $40 million. 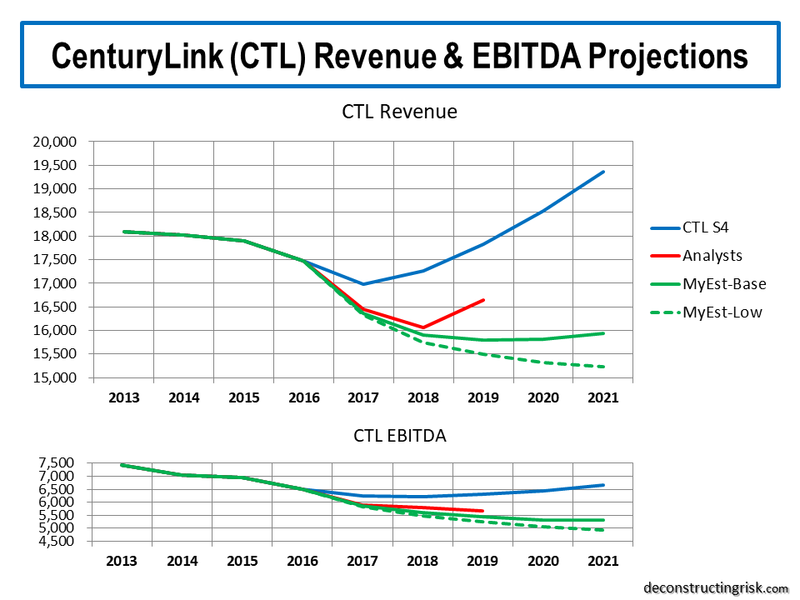 Secondly, and more importantly, the trend is lumpy and given CTL’s transformation focus, it makes total sense to me for CTL to cull low margin non-network centric revenues. Management were explicit in stating their intention “to focus on the network-centric things” and that this business is “distracting our organization and it’s not giving us anything, so we’ll stop it”. To me, that demonstrates confidence in the direction of the business. As Storey emphasised, when referring to culling low margin business, “we manage this business for free cash flow, free cash flow per share, these are good things to be doing”. Analysts concern that cutting expenses longer term cannot be a sustainable business plan without revenue growth at some point is certainly valid (and is one of the key risks with CTL). Indeed, I estimate that there is about $900 million and $500 million of quarterly legacy business and consumer revenues respectively (about 15% and 10% of total quarterly revenues) that could fall off at an accelerated pace as CTL refocuses the business over the medium term. CTL’s return to top line growth could be several years off yet. More on this later. Another area of concern from analysts was the fact that CTL will spend approx. $500 million less on capex in 2018 compared to original projections (with levels projected to return to a more normal 16% of revenues for 2019 and beyond). This could be interrupted as a desire not to invest in the business to inflate free cash-flow, never a good sign for any company. However, again management explained this as a desire to refocus capital spending away from items like copper upgrades and towards strategic areas. They cited the approval to bring on-net another 7,000 to 8,000 buildings and the use of strategic targeting of capex (using AI) across consumer and business geographies to maximise returns in urban areas where 5G infrastructure will be needed in the future. Again, a more disciplined approach to capex makes total sense to me and demonstrates the discipline this management team is imposing on the business. What seems to have been missed in the reaction to Q3 results is the extraordinary progress they have made on margin improvements. The EBITDA margin again grew to 39.3% with the projected operational synergies of $850 million now targeted to be achieved by year end. Management are keen to move the focus from integration to digital transformation from 2019. Achieving the targeted operational synergies so soon, particularly when we know that network expense synergies do not come through until 2 to 3 years after a merger, is an amazing achievement. It also highlights that their projected cost synergies of $850 million were way way under-baked. As I highlighted in this recent CTL post, I suspected this under-baking was to protect against the risk of any further acceleration in the underling margin erosion at the old CTL business as legacy business declined. CTL’s discipline in extracting costs, as seen by actions such as the (painful) 12% headcount reduction, is central to my confidence in CTL’s management achieving their strategic aims. I do not believe that a further $250 million and $200 million of cost synergies in 2019 and 2020 respectfully through further synergies, network grooming efforts and the digital transformation initiative is unreasonable. That would bring overall cost synergies to $1.3 billion, a level consistent to what LVLT achieved in the TWTC merger. So, given the likelihood of an increased purposeful erosion in low margin legacy business over the next several years combined with a higher level of cost extraction, I have recalculated my base and pessimistic scenarios from my previous post. 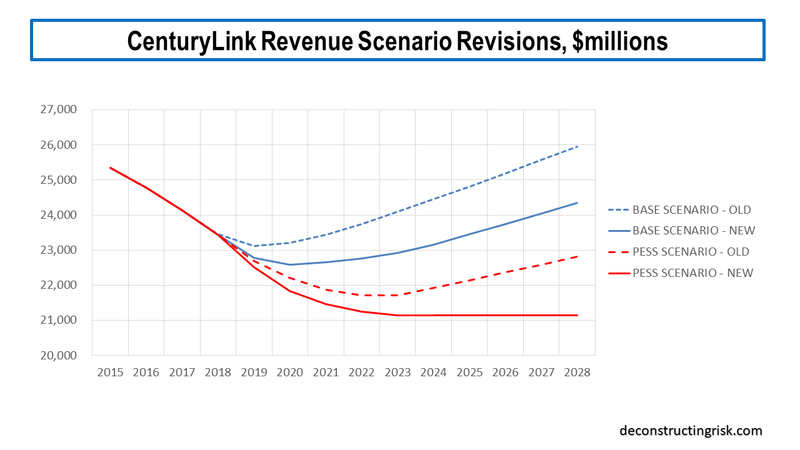 My base scenario, as per the graph below, shows annual revenues effectively flatlining over the next 3 years (2019 to 2021) around $23.3 to $23.6 billion before returning to modest top-line growth thereafter (i.e. between 1% and 1.5% annual growth) with an EBITDA margin of 42% achieved by the end of 2021 and maintained thereafter. This revenue profile mirrors that of previous LVLT mergers, albeit a longer period of flatlining revenues due to the amount of old legacy CTL to burn off. Capex is assumed at 16% of revenue from 2019 onwards. My projections also include further interest rate increases in 2019 and 2020 (as a reminder every 25-basis point change in interest rate results in an 8.5 basis point change in CTL’s blended rate). The current dividend rate is maintained throughout with FCF coverage ratio reducing from the low 70’s in 2019 to around 60% by the end of 2021. 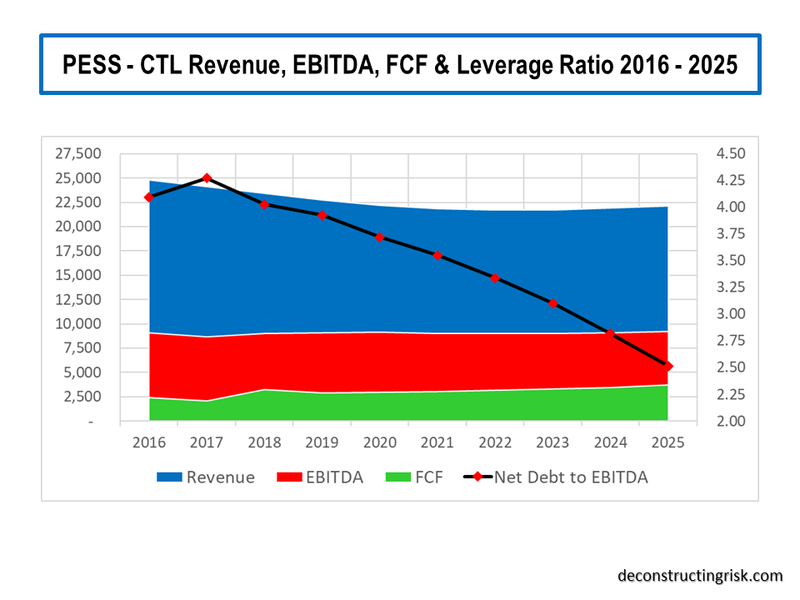 My DCF valuation for CTL under these base projections is $23 per share. That’s about 20% above its current level around $19 plus a 11% dividend yield. 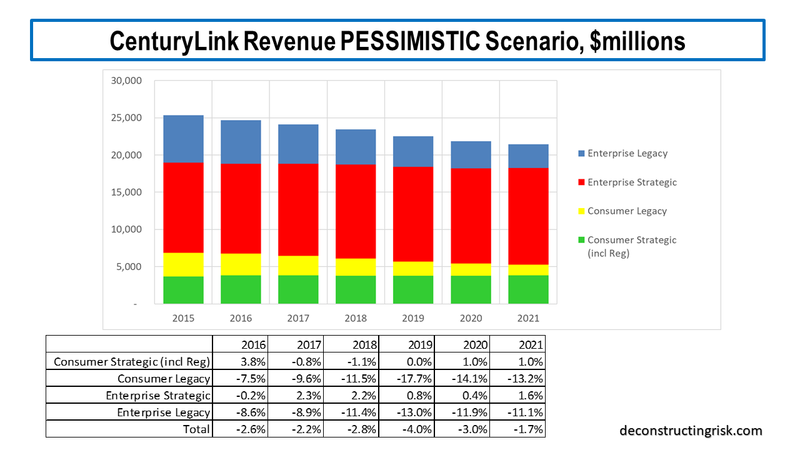 My pessimistic scenario, as per the graph below, assumes that the hoped-for revival of CTL into an on-demand service provider in the 5G age does not result in revenue growth after the legacy business has eroded for whatever reason (other technological advances over the need for a deep fiber network optic been the most likely). Annual revenue continues to decline to below $22 billion by 2021 and does not get above that level again until 2025. Although this scenario would be extreme, its not unknown in the telecom industry for future jumps in data traffic to result in falling revenues (eh, remember the telecom winter!). EBITDA margin levels get to 41% by the end of 2021 and slowly rise to 41.5% thereafter on further cost cutting. Capex and interest rate assumptions are as per the base scenario. In the pessimistic scenario the dividend level of $2.16 per share must be cut by 50% from 2020 to reflect the new reality and to deleverage the balance sheet. Although the share price would likely suffer greatly in such a scenario, my DCF valuation is $14 per share, 26% below the current $19 share price, not forgetting the reduced dividend yield after the 50% cut. As per my previous post on CTL, I see little point in contemplating an optimistic scenario until such time as revenue trends are clearer. A buy-out at a juicy premium is the most likely upside case. Consideration should be given in any projections over the medium term on the impact and timing of the next recession which is certain to happen over the 2019 to 2025 period. Jeff Storey has argued in the past that recession is good for firms like CTL as enterprises look to save money through switching from legacy services to more efficient on demand services. Although there is an element of truth to this argument, the next recession will likely put further pressures on CTL’s top-line (alternatively, an outbreak of inflation may help pricing pressures!!). Higher interest rates and lower multiples are a risk to the valuation of firms like CTL and the uncertainty over the future macro-economic environment make CTL a risky investment. 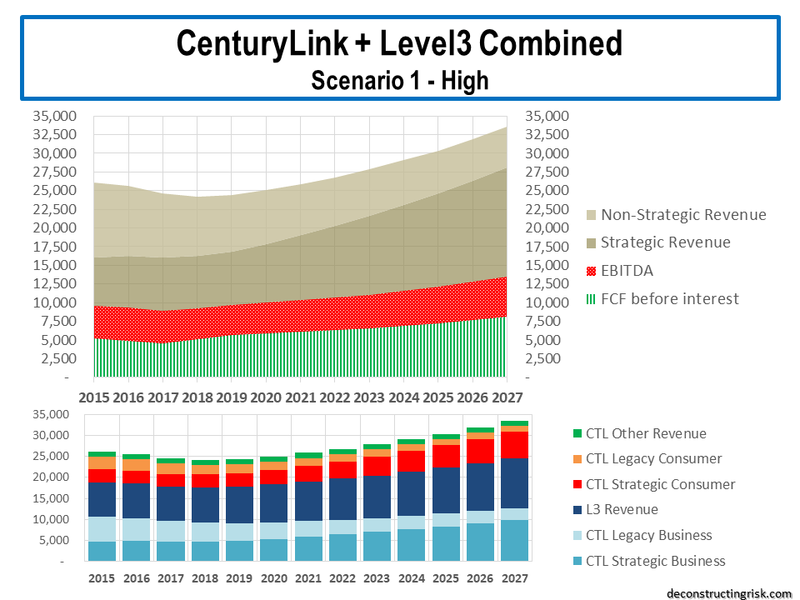 Notwithstanding the inevitability of a recession at some time, I do feel that the revenue projections above are already conservative given the explosion in network demand that is likely over the next decade, although increased signs of recession in late 2019 or 2020 would temper my risk appetite on CTL. To me, one of the biggest risks to CTL is the CEO’s health. Given Sunit Patel has left for T-Mobile (who I hope may be a potential buyer of CTL after they get the Sprint deal embedded and/or abandoned) and the new CFO will take some time to get accepted in the role, any potential for CTL not to have Jeff Storey at the helm over the next 2 years would be very damaging. Identifying and publicly promoting a successor to Jeff Storey is something the Board should be actively considering in their contingency planning. For now, though, I am reasonably comfortable with the risk reward profile on CTL here, absent any significant slow down in the US economy. 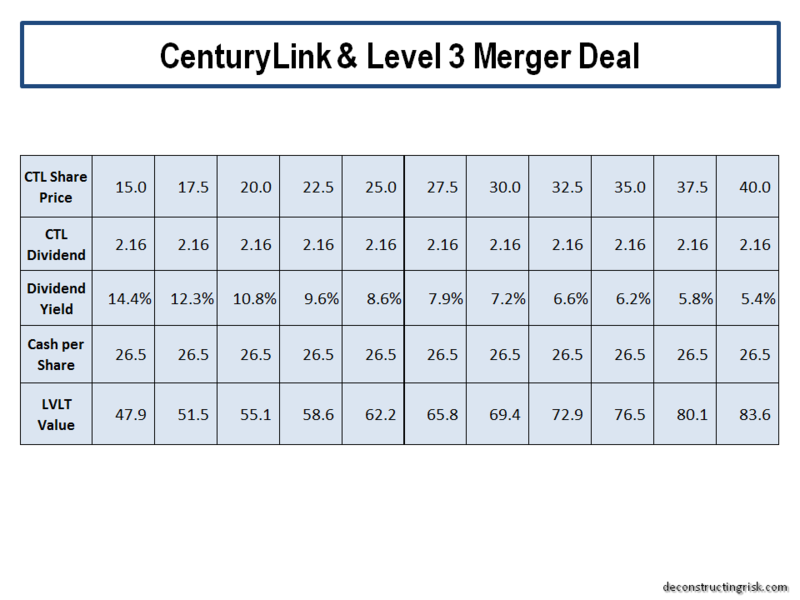 It’s been over 6 months since I last posted on the upcoming merger of Level 3 (LVLT) and Centurylink (CTL). Since then, LVLT’s CEO Jeff Storey has been named COO of the combined entity and CEO from January 2019, after a gentle push from activist investor Keith Meister of Corvex Management (here is an article on their latest position), effectively meaning the merger is an operational LVLT takeover of CTL. In June, CTL also got hit by a lawsuit from an ex-employer alleging a high-pressure sales culture which ripped customers off (an avalanche of class action suits followed). 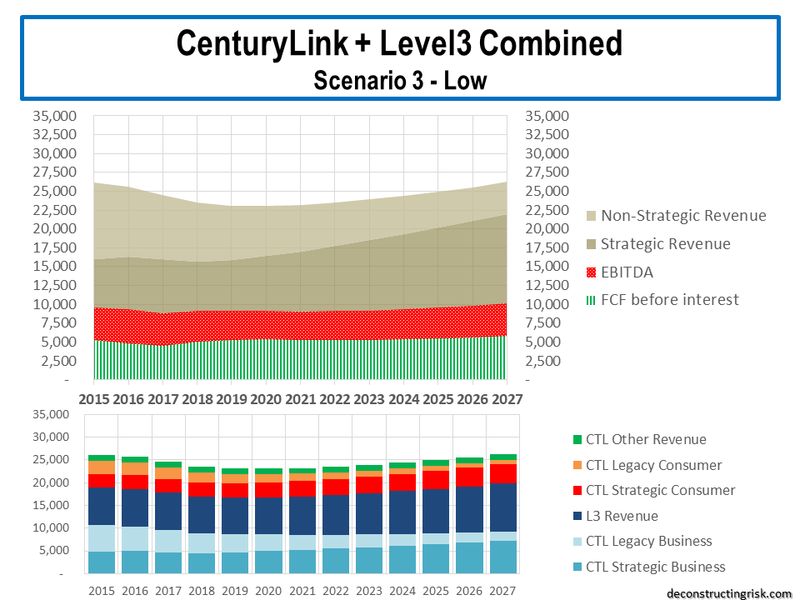 And, potentially more damaging, the recent results of CTL continue to point to deteriorating trends in the legacy part of their business and lackluster growth on the strategic part of the business. CTL missed their quarterly estimates again in the most recent quarter, the third miss in a row. Picking up on my recent telecom industry post, the sector will struggle in the short term to find top line growth before the full impact of new “digital lifestyle” opportunities emerge. The figures below for enterprise, including public sector, and wholesale revenues for some of the biggest US players (which have been adjusted judgmentally for items such as the impact of the XO acquisition on Verizon’s revenues and the ever-changing classifications and reclassifications that telecom’s love) illustrate the current struggle in getting newer IP enabled services to fully compensate for declining legacy revenues. These figures imply average quarterly declines since 2014 of -0.3% and -1.2% for enterprise and wholesale business respectively. However, the trend has been getting worse. The average quarterly change was 0.2% and -1.1% for enterprise and wholesale business respectively from 2014 to 2015. Since 2016, the average quarterly change is -0.9% and -1.3% for enterprise and wholesale respectively. Not exactly a cheery trend when contemplating the prospects of a merged CTL/LVLT! As can be seen below, the share price of LVLT and deal implied price have converged, particularly as CTL’s dividends get paid, albeit with a sharply downward bias in recent weeks over worries about dividend sustainability, valuation, sector trends, lawsuits and uncertainty over the closing date of the merger (a delay by California, the last State approval needed, may mean the end of September deadline is missed). 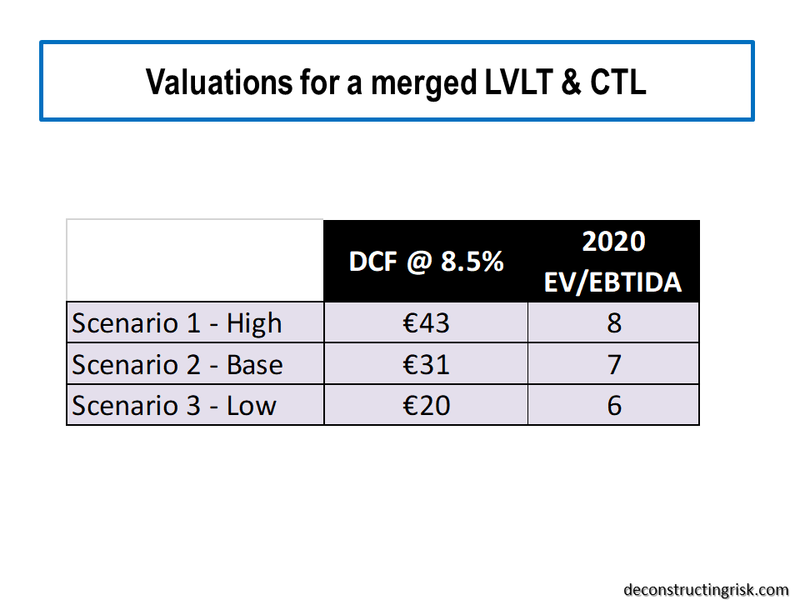 My estimates for a standalone LVLT compared to analyst figures and those presented by LVLT management in the S4 (figures presented for merger negotiations are generally on the optimistic side) are below. Even factoring in higher interest rates (about 40% of LVLT’s debt is floating) over the coming years, I am comfortable with a standalone share price around the current mid-50’s, in the unlikely event the merger falls apart. To recap on my confidence in the ability of LVLT’s current management team to deliver, the results of the last merger between LVLT and TWTC show that management delivered a 40% uplift in the amount of free cashflow (e.g. EBITDA less capex) on flat revenues from 2014 to 2017 (e.g. combined FCF of both entities in the year prior to the merger to actual H1 results and my estimates for H2 2017). Some of my many previous posts on LVLT are here, here and here. Such a repeat in FCF in the CLT/LVLT merger is not a realistic expectation given the larger scale and different business mix, as the analysis below illustrates. Of course, the flat revenues over the past 3 years is a key concern (but worthy of praise given the industry trends highlighted above) and one of the catalysts for the CLT deal. Also, the health of designate CEO Jeff Storey may also be a factor over the next few years given his heart issues a few year ago. My knowledge of CTL’s business is not as deep as that of LVLT’s and my confidence in their prospects on a standalone basis is nowhere near as lofty. My projections, split over a conservative base scenario and a more conservative low business scenario, can be seen below. My projections are primarily based upon the more recent trends in their business lines across their legacy and strategic enterprise and consumer businesses. The vast variance in my estimates, based upon recent trends, and those presented by management in the S4 (again, acknowledging that these are generally optimistic) illustrates why the market has lost such confidence in the outgoing management team at CTL, in my opinion. In terms of trying to model the merged CTL/LVLT, I have assumed the deal closes by the end of 2017 with 2018 being the first year of the merged entity. I have made a number of judgmental adjustments in my model, including assuming some loss of revenue due to the merger and cost reductions above published target synergies (e.g. $1 billion of operating synergies by end 2020 and $150 million of capex synergies by end 2019, higher than the announced target savings of $850 million and $125 million for opex and capex respectively). 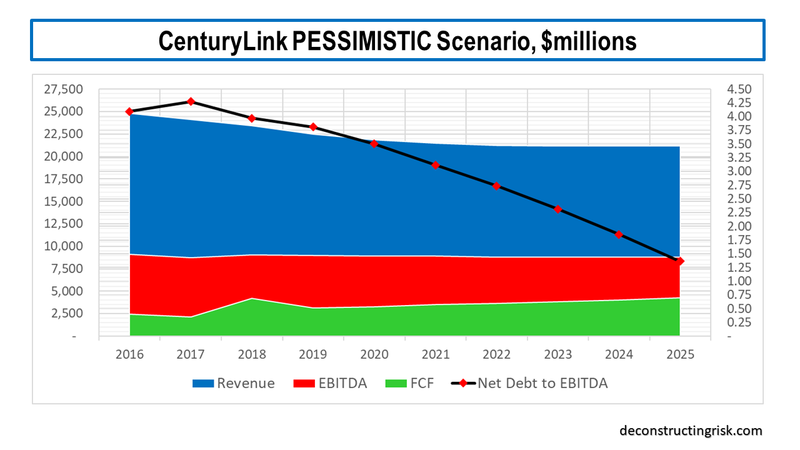 I have taken analyst estimates as an optimistic case (in CTL’s case I have taken their EBITDA estimates but still can’t get anywhere near their revenue figures) and called it the high scenario. My two projections above are used for the base and low scenarios. The resulting operating metrics for each scenario is shown below. The high scenario shows revenues flat-lining slightly above $24 billion for 2018 and 2019 with top-line growth returning in 2020 (YoY above 2.5%). EBITDA margins hit 40% by 2019 and remain stable around 40% thereafter. Capex is assumed to hit 15.5% of revenues by 2019 and remain at that percentage thereafter. This scenario assumes that management will be able to generate an approximate 30% uplift in the amount of free cashflow (e.g. EBITDA less capex) from 2017 (e.g. combined FCF of both entities in the year prior to the merger) to FY 2020. 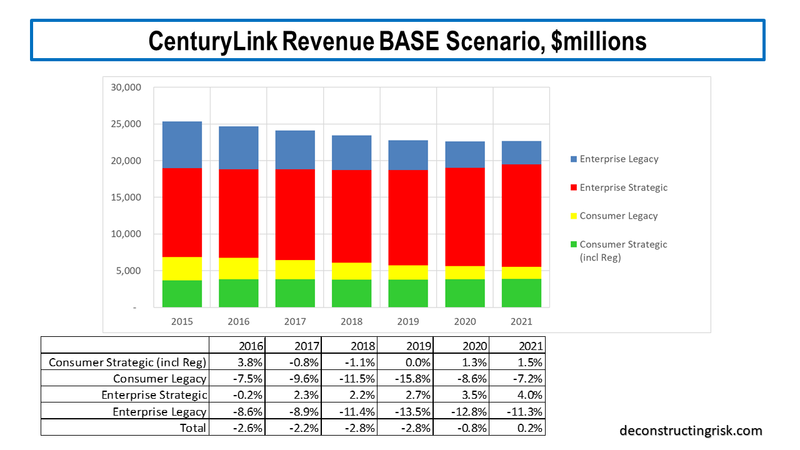 The base scenario shows revenues flat-lining around $23.5 billion for 2018 through 2020 with top-line growth returning in 2021 (YoY just below 2%). EBITDA margins hit 40% by 2019 and slowly trend down toward 39% thereafter. Capex is again assumed to hit 15.5% of revenues by 2019 and remain at that percentage thereafter. This scenario assumes that management will be able to generate an approximate 22% uplift in the amount of free cashflow (e.g. EBITDA less capex) from 2017 (e.g. combined FCF of both entities in the year prior to the merger) to FY 2020. The low scenario shows revenues around $23.5 billion for 2018 and drifting down to $23 billion before slowly hitting $23.5 billion again by 2022. Thereafter revenue growth builds slowly from 1.5% to 2.5% by 2027. EBITDA margins hit 39.5% by 2019 and slowly trend down toward 38.5% thereafter. Capex is again assumed to hit 15.5% of revenues by 2019 and remain at that percentage thereafter. This scenario assumes that management will be able to generate an approximate 18% uplift in the amount of free cashflow (e.g. EBITDA less capex) from 2017 (e.g. combined FCF of both entities in the year prior to the merger) to FY 2020. That leads to the thorny question of the sustainability of the annual dividend of $2.16 per share (particularly given that share count will double, amounting to $2.3 billion per year). 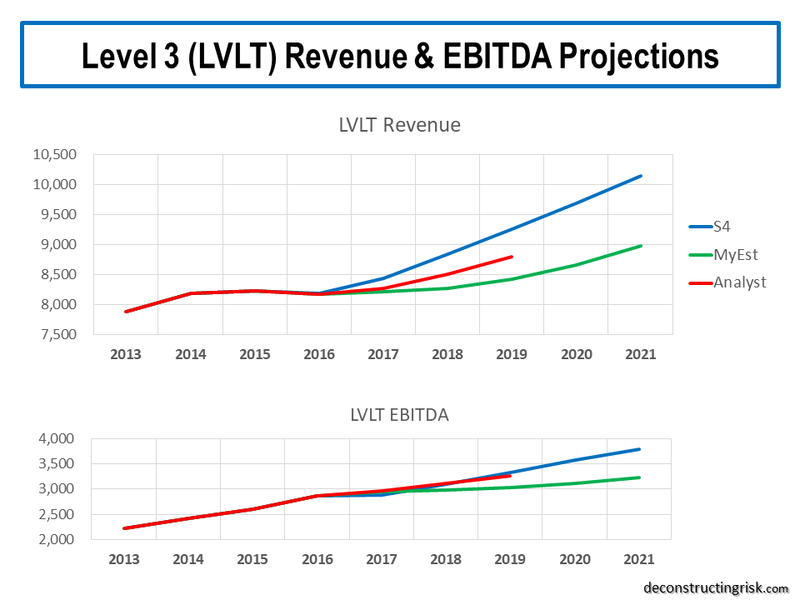 Under the high scenario, maintaining the current dividend and getting the net debt multiple below 3 by 2021 is doable if a little tight (primarily due to the cashflow benefits of LVLT’s NOLs). For both of the base and low scenarios maintaining the current dividend level is not realistic in my view, with a cut in the dividend to $1.30 and $1.00 needed in each scenario respectively (a 40% and a 55% cut). The current dividend yield on CTL is over 10%. Each of the cuts above would reduce that yield to approximately 6% and 5% for the base and low scenarios respectively based upon the current share price. Addressing the uncertainty over the dividend should be one of the priorities of the new management (and may even result in Jeff Storey’s move to the CEO position ahead of the planned January 2019 date). Finally, before I reveal my per share valuations, I haven’t given any consideration to the financial impact of the current legal cases on alleged aggressive sales tactics as the level of current detail makes any such estimate impossible. Some of the class action cases claim anything from $600 million to $12 billion but these claims are always bloated and the eventual settlement figure, if there even is one, are often for a lot less than that claimed. Nor have I considered the potential impact of a spin-off of the consumer business (that’s for another time!). So, based upon the analysis outlined in this post and using a discount rate of 8.5%, my valuation estimates for each of the three scenarios are below. The market’s current valuation of CTL around $20 indicates scenario 3 as the current expectation. This emphasizes the need to address the uncertainty over future dividend levels and the validity of the legal cases. Uncertainty over the closing date of the deal is overblown, in my view, and a few months of delay will not prove material. I do think the current valuation is harsh, given the potential upsides from the deal and longer-term industry trends. Interestingly, my base scenario valuation of £31 is not too far off the value of $34.75 by BofA Merrill Lynch and Morgan Stanley in the S4 (see this post on the S4). The base scenario is the one I would have the most confidence in, based upon my current knowledge, rather than the high scenario of $43 which does look too optimistic to me given current market trends. I was never going to reinvest the cash component of the deal for LVLT shareholders given my current reservations about market valuations and move to cash across my portfolio. The analysis presented in this post indicates to me that the CTL shares due from the deal for LVLT shareholders are worth holding from a valuation perspective. For now. For new investors, I’d wait to see how some of the uncertainties play out, particularly the dividend issue. The M&A permutations being talked about in the US telecom sector are fascinating. The AT&T/Time Warner deal has commentators frothing at the mouth about possible tie-ups, particularly given the laissez faire attitude to regulation of the new FCC Chairman, Ajit Pai. Names such as DISH, Comcast, Disney, Netflix, SiriusXM, Charter are regularly tied to the big telcos and/or each other in the speculation. 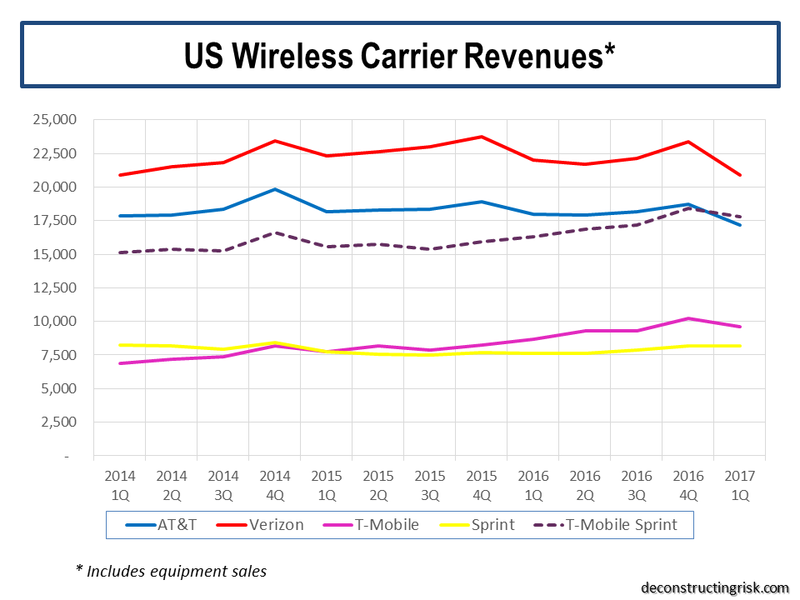 Existing wireless revenues from AT&T and Verizon have plateaued and are now starting to decrease due to cut throat competition on unlimited plans from T-Mobile and Sprint, as the graph below shows. The T-Mobile/Sprint merger is now been talked about again, after the year long FCC spectrum moratorium on competitors talking has passed. The current bidding frenzy between AT&T and Verizon over Straight Path’s millimetre wave frequencies that can be used to carry large amounts of data over short distances has brought the hype over 5G services to a new high. Verizon’s purchase of XO last year enabled them to lease XO’s 102 LMDS licenses in the 28 GHz and 39 GHz bands so it is somewhat surprising to see them be so aggressive in bidding for Straight Path. The analyst Craig Moffett believes that the winning bidder for Straight Path will have significant leverage with the FCC in determining how these wave frequencies are repackaged for use by competitors. 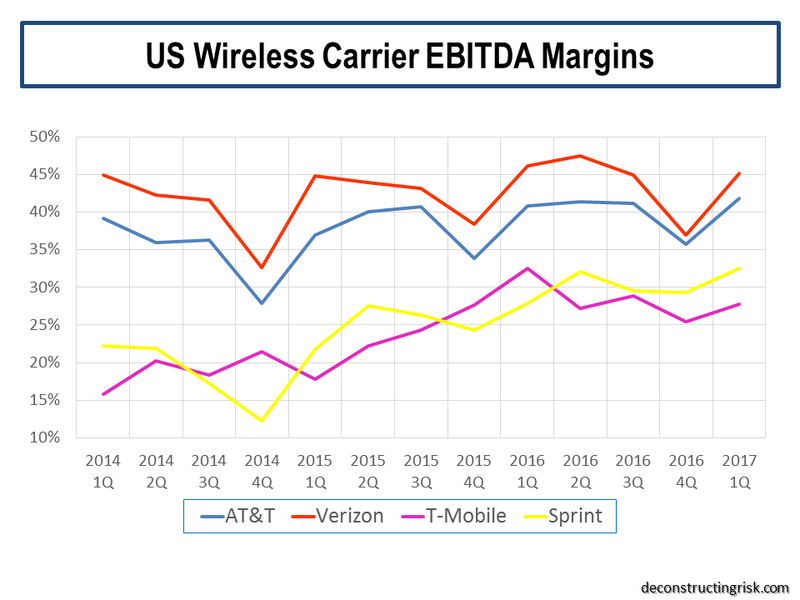 Although wireless margins are not under significant pressure, as the graph below shows, it is obvious that there is now a full scale war for control of the wavelengths that will be critical to 5G services in the search for new revenues. T-Mobile and DISH are also holders of high frequency wavelengths been touted as suitable for 5G. The fascinating thing about the frenzy over Straight Path is that the hype over high frequencies such as the 39 GHz band is not new. The reason such spectrum has gone largely unused in the past is that it has been historically difficult to create reliable, secure, mobile connections in those bands. Variable weather conditions, often something as common as a rainy day, can impact coverage in high frequencies. I wonder what’s changed? As regular readers will know, I have posted on Level 3 (LVLT) many times over the years, more recently here. I ended that post with the comment that following the firm was never boring and the announcement of a merger with CenturyLink (CTL) on the 31st of October confirmed that, although the CTL tie-up surprised many observers, including me. Before I muse on the merger deal, it is worth looking over the Q3 results which were announced at the same time as the merger. The recent trend of disappointing revenue, particularly in the US enterprise business, was compounded by an increased projection for capex at 16% of revenue. Although the free cash-flow guidance for 2016 was unchanged at $1-$1.1 billion, the lack of growth in the core US enterprise line for a second quarter is worrying. Without the merger announcement, the share price could well have tested the $40 level as revenue growth is core to maintaining the positive story for the market, and premium valuation, of Level 3 continuing to demonstrate its operating leverage through free cash-flow growth generation. 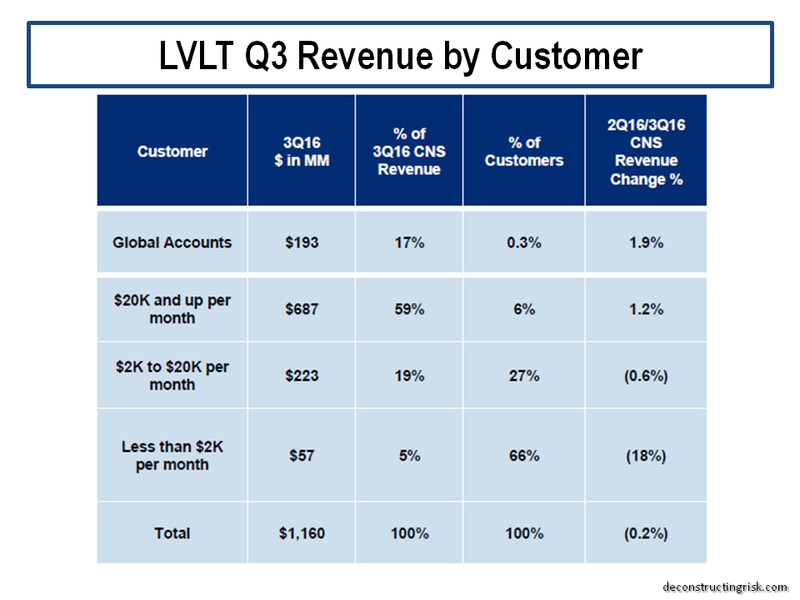 Level 3 management acknowledged the US enterprise revenue disappointment (again!) and produced the exhibit below to show the impact of the loss of smaller accounts due to a lack of focus following the TW Telecom integration. CEO Jeff Storey said “coupling our desire to move up market, with higher sales quotas we assigned to the sales team and with compensation plans rewarding sales more than revenue, we transitioned our customers more rapidly than they would have moved on their own”. The firm has refocused on the smaller accounts and realigned sales incentives towards revenue rather than sales. In addition, LVLT stated that higher capex estimate for 2016, due to strong demand for 100 Gig wavelengths and dark fibre, is a sign of future strength. Although these figures and explanations do give a sense that the recent hiccup may be temporary, the overall trends in the sector do raise the suspicion that the LVLT story may not be as distinctive as previously thought. Analysts rushed to reduce their ratings although the target price remains over $60 (although the merger announcement led to some confused comments). On a stand-alone basis, I also revised my estimates down with the resulting DCF value of $60 down from $65. 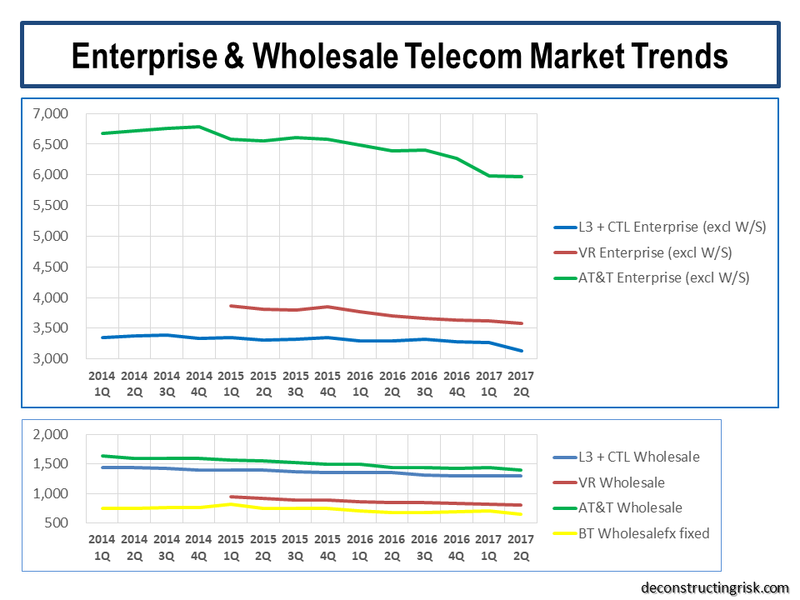 Many commentators point to overall revenue weakness in the business telecom sector (includes wholesale), as can be seen in the exhibit below. Relative newcomers to this sector, such as Comcast, are pressuring tradition telecoms. Comcast is a firm that some speculators thought would be interested in buying LVLT. Some even suggest, as per this article in Wired, that the new internet giants will negate the need for firms like Level 3. However, different firms report revenues differently and care needs to be taken in making generalisations. If you take a closer look at the revenue breakdown for AT&T and Verizon it can be seen that not all revenue is the same, as per the exhibit below. 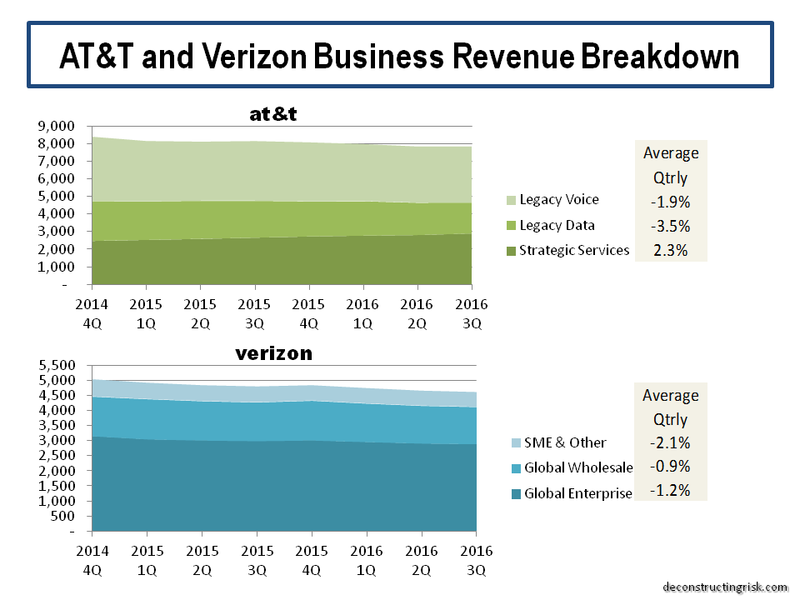 For example, AT&T’s business revenues are split 33%:66% into strategic and legacy business compared to a 94%:6% ratio for LVLT. That brings me to the CenturyLink deal. The takeover/merger proposes $26.50 in cash and 1.4286 CTL shares for each LVLT share. $975 million of annualised expense savings are estimated. 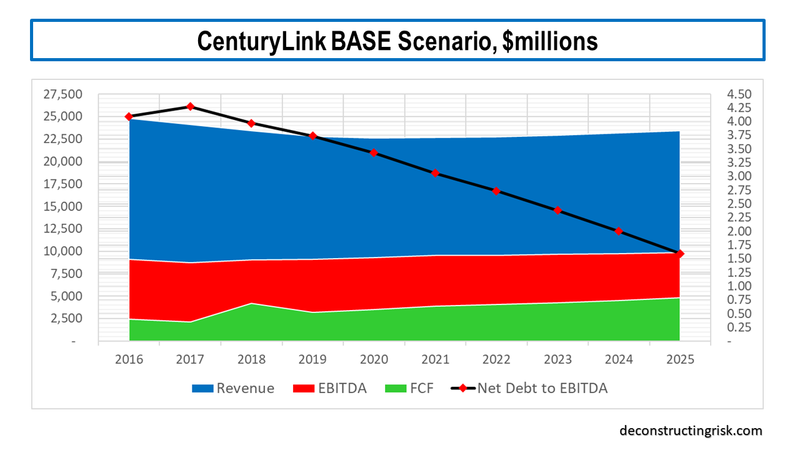 The combined entity’s debt is estimated at 3.7 times EBITDA after expense savings (although this may be slightly reduced by CTL’s sale of its data centres for $2.3 billion). LVLT’s $10 billion of NOLs are also cited by CTL as attractive in reducing its tax bill and maintaining its cherished $2.16 annual dividend (CTL is one of the highest yield dividend plays in the US). The deal is expected to close in Q3 2017 and includes a breakup fee of about $2 per LVLT share if a 3rd party wants to take LVLT away from CTL. 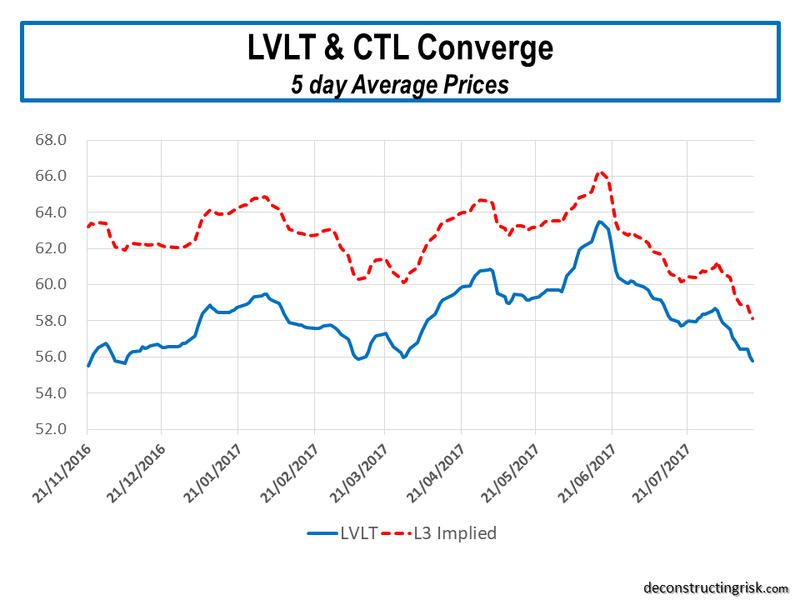 Initially, the market reaction was positive for both stocks although CTL shares have since cooled to $23 (from $28 before the deal was announced) whilst LVLT is around $51 (from $47 before) which is 13% less than the implied takeover price. The consistent discount to the implied takeover price of the deal since it was announced suggests that the market has reservations about the deal closing as announced. The table below shows the implied value to LVLT of the deal shareholders depending upon CTL’s share price. CTL’s business profile includes the rural consumer RBOC business of CenturyTel and nationwide business customers from the acquired business assets of Qwest and Sprint. It’s an odd mix encompassing a range of cultures. For example, CTL have 43k employees of which 16k are unionised. The exhibit below shows the rather uninspiring recent operating results of the main segments. 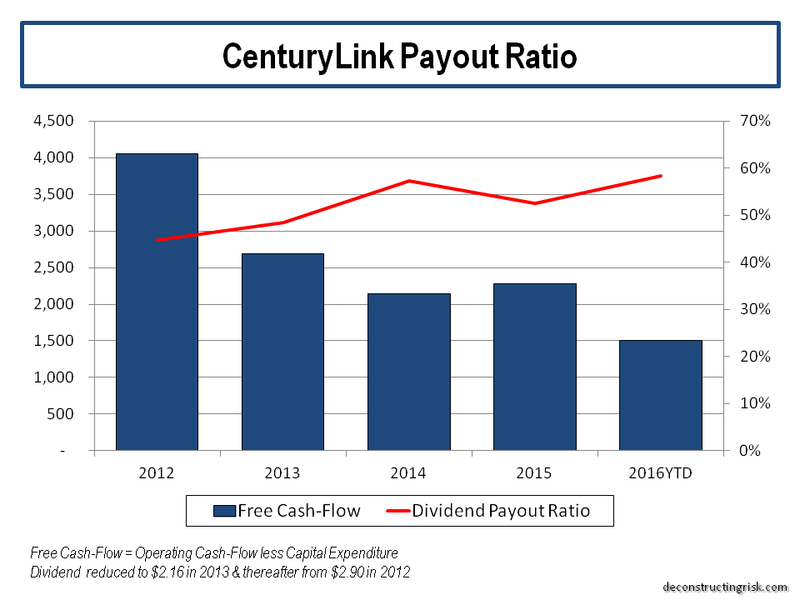 CTL’s historical payout ratio, being its dividend divided by operating cash-flow less capex, can be seen below. This was projected to increase further but is expected to stabilise after the merger synergies have been realised around 60%. The advantage to CTL of LVLT’s business is an enhancement, due to its free cash-flow plus the expense synergies and the NOLs, to CTL’s ability to pay its $2.16 dividend (which represents a 9.4% yield at its current share price) at a more sustainable payout rate. For LVLT shareholders, like me, the value of the deal all depends upon CTL’s share price at closing. I doubt I’ll keep much of the CTL shares after the deal closes as CTL’s post merger doesn’t excite me anywhere as much as a standalone LVLT although it is an issue that I am still trying to get my head around. As per the post’s title, I’m confused but content about events with LVLT.